Saint Madeleine Sophie Barat, Foundress of the Sacred Heart schools, believed in the power of education to transform individuals - and the power of individuals to transform society. 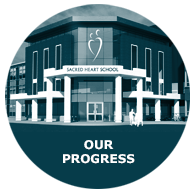 True to that vision, Sacred Heart School of Halifax has, for over 168 years, been providing students with an exceptional education and an outstanding experience. We don’t push our students to be the best in the world, we inspire them to be the best for the world. Today, in this ever-changing global landscape, and with the need for a more innovative and personalized approach to learning, we aspire to be the undisputed leader in education and experiential excellence; a drive that shapes our vision of the future and builds on the timeless legacy of Sophie Barat.